« Do Your Eggs Fly? Leftovers? Cover them with DIY bowl covers. Child: Can I have some (juice, kefir, water, milk, moonshine)? Adult: Why, of course! pulls out cup, fills it halfway with desired liquid. Child: Thanks! proceeds to drink 1/2 – 2/3rd of liquid, leaving the rest and runs off. The truth is, my family doesn’t belong to the clean plate club. And given the strange feeding habits of the very young, my girls often pick at their plates, decide they’re not hungry, only to return – totally famished – sometime later. 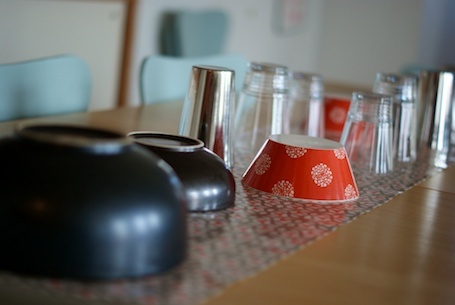 Thus, I was looking for a way to keep food and drink fresh for exactly these occasions, while avoiding plastic wrap – which is not only wasteful, but annoying to use. The collective wisdom of the Internet has a number of tutorials, all variations on this project, and they looked easy enough to try. My first instinct was to go with oilcloth, since I love all those cheerful Mexican designs, but unfortunately oilcloth isn’t food safe (and its phthalate level makes it unsafe for use around children in general). However, a good substitute is laminated cotton (which is laminated with polyurethane, not PVC). Now, I will be the first to admit that I’m not exactly sure how “green” laminated cotton is – but it’s reusability make it a step up from plastic wrap. Plus, there are a lot of beautiful laminated cotton designs to choose from. My favorites are from Michael Miller, Amy Butler, and Heather Bailey. 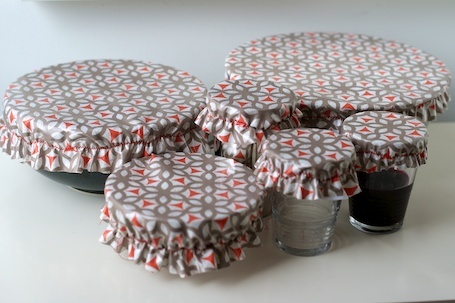 I ordered enough to create a tablecloth and then cut off the rest to make various bowl covers. 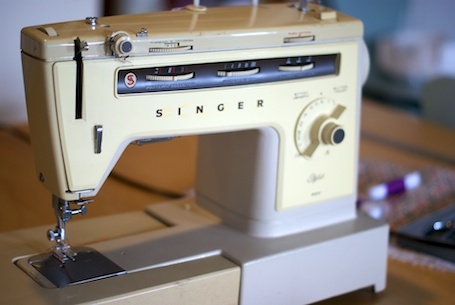 This was also a chance to unearth my sewing machine – a 1970’s Singer that I inherited from my dear grandmother. I’m not a very good seamstress, but I have kept this machine throughout my travels out of a mixture of nostalgia and optimism. The compass and ruler are handy, but actually not essential (unless you are a perfectionist). Step 1: Take your cup or bowl and trace around it. You will then want to cut the fabric at a circumference roughly 1-2 inches larger than the rim of your dish. You can either use the compass or eyeball it. I chose the latter. Step 2: Set your sewing machine to a zigzag stitch and adjust it so that the stitch is short and fairly wide. You will want to sew your elastic in the area between the circle you drew and the edge of your fabric. Make sure to back-stitch at the beginning to hold the elastic in place. 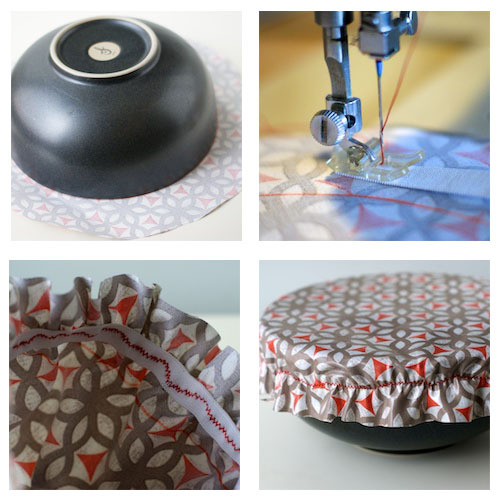 The trick is to stretch the elastic while sewing in a circle – which, frankly, isn’t that easy. Mine looks like I started this project by tossing back several mojitos in quick succession (I didn’t), but they are functional despite the somewhat inebriated nature of the stitching. When you are finished, your circle will be gathered like a little shower cap and should stretch right over the dish you started with. I will admit to a bit of a learning curve to the first couple, but once I got the hang of the sewing I was able to make a dozen of these in a little over an hour. Now, each morning when my daughters inevitably fail to finish whatever they are drinking, we put a little hat on their glass and save it for when they get home from school. Problem solved! This entry was posted on April 20, 2012, 12:55 pm and is filed under inspiration, kids, kitchen. You can follow any responses to this entry through RSS 2.0. You can leave a response, or trackback from your own site. Totally want to do this. darnit, i really need to get a sewing machine!! thanks for sharing! This is a great idea since our household is very leftover-friendly and I have the same sewing machine, inherited from from my Mother. What a great idea! My daughter is not a member of the clean plate club either and plastic wrap is impossible. Will have to try this.